A Guide to Quality, SEO Friendly Content Marketing. How to Write Content! 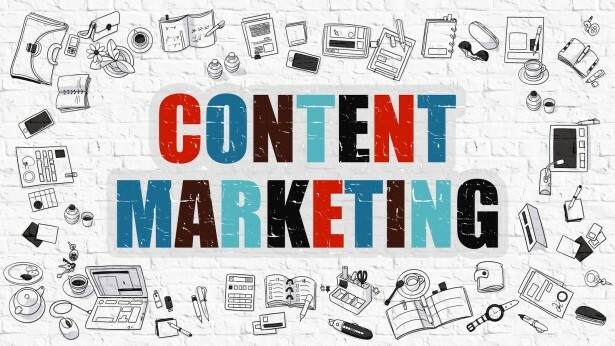 Content marketing is an essential part of any good SEO project but, in order for it to pay off and be worthwhile to your business, your content needs to be quality and SEO friendly. Not sure where to start? Well luckily I have all of the tips and tricks you’ll need on how to write online content and combat the problems you’re sure to face such as writer’s block, finding keywords, and on-page optimisation. My first (and most important) tip would be don’t write for writing’s sake. The content you’re putting out needs to be relevant and purposeful. So before you go storming ahead and frantically writing content for your website; sit back, relax, grab a pen, some paper, and a cuppa as you read my guide to writing online content. So What is Content Marketing and Why is it Important? Marketing your business through content such as blog posts is a great way of interacting with your customers without bombarding them with advertisement. It is a chance to open a dialogue with your customers or clients, giving your company a voice. It’s also a subtle but really useful method of enticing your customers to your website and eventually buying into your products and services. From an SEO perspective, content builds trust and authority as long as it is consistent and engaging. Once you finesse your content writing skills you will reap in the benefits as your website begins to appear on the top pages of Google! Quantity is great as long as the quality is always at a high standard. It’s easy to churn out mediocre blog posts for the sake of links but if your content is not engaging you will not gain a loyal customer following which is the ultimate aim. This is a generation of bloggers, so to compete with the best you need to be the best! Every brand will have a tone a voice that is reflected in their content. Develop a tone of voice that represents how you want your brand to come across to your customers, whether it is fun and upbeat or educational and informative. Generally, a conversational and informal voice is best for blogs. Have your reader in mind, they may not be experts in your subject so keep your writing simple but interesting. Planning is key when writing content. I understand writing doesn’t always work out like that as, more often than not, an idea springs to mind and you run with it. However, if you can gather all of your ideas and information on paper, you’ll be able to create a well thought out structure which can prevent that frustrating writer’s block! 3. Grab the reader with a compelling headline! Structure your content with bold headlines that entice the reader to find out more. In this fast moving generation where time is precious and attention spans are miniscule, short paragraphs with sub headers and bullet points will make it an easy and quick read. Make your content as convenient as possible so your audience can read it while they go about their daily lives, whether that’s commuting, on their lunch break, or cooking dinner. Your customers will thank you for all your useful information but they won’t for making them miss their train as your content was that compelling! As I mentioned earlier your content needs to be convenient and engaging. Whilst your customer reads your blog or skim reads, their aim is finding what your brand does and what you can offer them. Large blocks of writing will immediately put your customer off but images will keep them on the page. Images give an accurate representation of your brand and customers are more inclined to trust what they are buying if they can visualise it. The more you have, the more authority you gain so get snapping! Remember these images represent you and your brand so keep them clean and crisp. Hit writer’s block yet? Finding the whole process frustrating and wanting to give up? We feel you! Content writing may seem like an unnecessary and stressful task but once you get your content writing niche you will soon be flying! I have hopefully showed you why content marketing is worthwhile but if not I have one more step that is sure to convince you. Your aim in creating SEO friendly content is to improve your website’s search rankings and to do this you need to focus on keywords and links. Using software or websites such as KW Finder, you can find the top keywords that are related to your brand, with details of search volume and difficulty to rank for. Including carefully chosen keywords throughout your content without over-saturating (or stuffing) will increase your chances of your website being found on Google. Optimise your content by including these keywords in your titles, opening paragraphs, meta title and meta description. 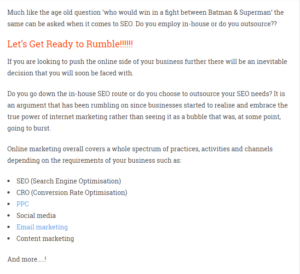 If your blog runs on WordPress (as ~25% of all websites do) you can install helpful plugins such as Yoast that help you with the optimisation process. Link building is also vital to improving your SEO. Each blog you write should ideally have meaningful internal links to other pages on your site and several external links leading to authoritative websites. Link building is an integral part of SEO so to find out more about it, read through the comprehensive guide on moz.com. And there you have it, you have written some quality, SEO approved content and ventured into content marketing which will soon pay off for your business. As a content writer myself, I understand the highs and lows of content marketing. I have taken you through all of the emotions of a content writer, from starting off optimistic, waffling, having those light bulb moments, to hitting writer’s block and giving up, and then finally feeling proud that you have completed a good, quality piece of content! Content marketing is big business these days so it is important that your brand is involved. It is an opportunity to be creative, showcase your brand and its services, and improve your SEO. Once you get it right by following my guide, you will build an impressive customer following, brand awareness and authority. My top tip is to always be consistent in quality and quantity and your loyal customers will return time after time. Need more inspiration? Take a look at a blog post by @foundd_mark on how to generate blog post ideas.